Fig. 37 Deflationary gap. (b) Alternatively, aggregate supply can be depicted in terms of the various levels of real national income supplied at each price level. Again, once the economy reaches the full employment level of real national income, the aggregate supply schedule becomes vertical. 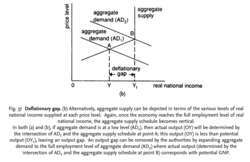 In both (a) and (b), if aggregate demand is at a low level (AD1 ), then actual output (OY) will be determined by the intersection of AD1 and the aggregate supply schedule at point A; this output (OY) is less than potential output (OY1 ), leaving an output gap. 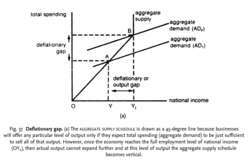 An output gap can be removed by the authorities by expanding aggregate demand to the full employment level of aggregate demand (AD2) where actual output (determined by the intersection of AD2 and the aggregate supply schedule at point B) corresponds with potential GNP. Fig. 37 Deflationary gap. (a) The AGGREGATE SUPPLY SCHEDULE is drawn as a 45-degree line because businesses will offer any particular level of output only if they expect total spending (aggregate demand) to be just sufficient to sell all of that output. However, once the economy reaches the full employment level of national income (OY1 ), then actual output cannot expand further and at this level of output the aggregate supply schedule becomes vertical. the shortfall in total spending (AGGREGATE DEMAND) at the FULL EMPLOYMENT level of national income (POTENTIAL GROSS NATIONAL PRODUCT). Because of a deficiency in spending, some of the economy's resources lie idle and ACTUAL GROSS NATIONAL PRODUCT is below that of potential GNP. To counteract this deficiency in spending, the authorities can use FISCAL POLICY and MONETARY POLICY to expand aggregate demand. See also DEFLATION, REFLATION, INFLATIONARY GAP. 1 percent of GDP, effectively adding to the deflationary gap the equivalent of 2. And it has been doing that literally from the first day the deflationary gap surfaced back in the early 1990s. In the meantime, however, it also means accelerated debt repayment by these companies and enlarged deflationary gap for the economy as a whole. Is the Japanese recovery for real?